As the flood waters have receded in north Gujarat, what is left behind is a trail of disaster. In adjoining Runi village, people scurry as the relief material reached them only in the last two days. But their local Congress legislator Dharsinhbhai Khanpura is missing. He is holed up at a five star resort in Bengaluru along with nearly 40 others. 17 villagers died including Javanji Sangram's 5-year-old son and 2-year-old daughter. Deesa, North Gujarat: A week after he lost 14 members of his family in Khariya village in north Gujarat in one of the worst floods in the region, 35-year-old Javanji Sangram today returned to rubble, what once used to be his home. 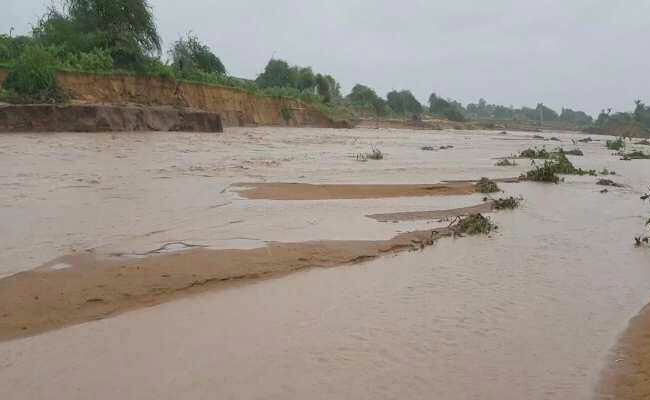 Last Sunday, when Banas river flooded its embankment, several villages in Deesa, Dhanera and Kankrej were inundated. At least 28 villagers of Khariya in Kankrej taluka who were in their fields were caught in the raging floods. All of them took refuge on the terrace of Mr Sangram's house. But after almost six hours, the house got swept away. 17 villagers died including Mr Sangram's five-year-old son and two-year-old daughter. He and his wife clung onto a tree and were rescued after almost 48 hours. "The water didn't give us any chance... There was no proper alert... We thought it would be normal floods that took place in 2015... but this time everything got swept away," he told NDTV. As the flood waters have receded in north Gujarat, what is left behind is a trail of disaster. In adjoining Runi village, people scurry as the relief material reached them only in the last two days. But their local Congress legislator Dharsinhbhai Khanpura is missing. He is holed up at a five star resort in Bengaluru along with nearly 40 others as the Congress flew its Gujarat MLAs out, accusing the ruling BJP of using "money, muscle and state power" to engineer defections in Gujarat ahead of the crucial Rajya Sabha poll. A man who lost his mother in the floods, wants his MLA to be on the ground. "I have lost my mother, my house, everything... The least we expect is our local MLA to be here," said Gandabhai. Veteran politician Shankersinh Vaghela's resignation from the Congress earlier this month may have caused a political tremor in Gujarat but its aftershocks are being felt in faraway Banaskantha. From Congress leader Ahmed Patel to BJP's Smriti Irani to chief minister Vijay Rupani camping, the district has witnessed a flurry of political activity. The Congress has six MLAs from the district - four in worst flood-affected areas and all of them are now in Bengaluru. Realising that their absence could damage their chances in the forthcoming assembly polls, some have deployed their family members in flood-affected areas. Deesa MLA Govabhai Desai's son Sanjay is going door-to-door in affected areas for relief work. He counters the BJP's charge that the Congress legislators are missing. "He was there when the heavy rains came in... Moving not just in his constituency but other areas as well. BJP is trying to politicise it," said Sanjay Desai. But the message from the flood-affected is clear: Forget politics and help in this hour of crisis.